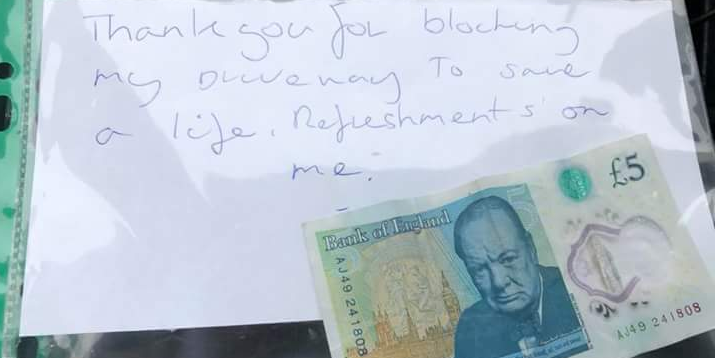 A person left a note and a £10 on an ambulance to show their appreciation to the ambulance crew. 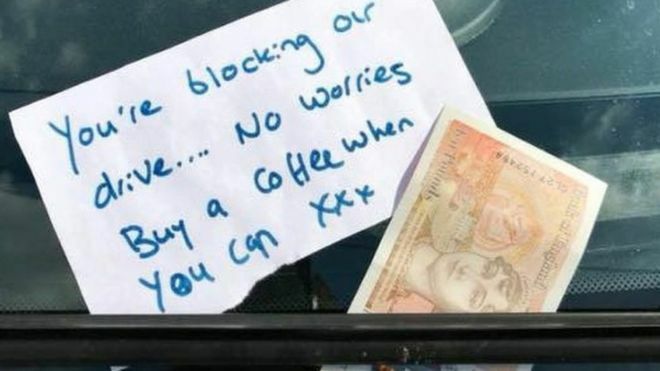 The note, alongside the £10 note, reads "You're blocking our drive... No worries buy a coffee when you can". The ambulance crew, Gary Turley, and his colleague were attending a patient in Faversham. Gary told BBC Radio Kent, "It was just really uplifting and restored our faith in humanity". He also added at first they "expected the worst"
Another person, late August also left a note and a £5 note on the front of an ambulance as a thank you for their service. However, in all this good news there has been bad news. Recently, there have been a few people leaving angry notes on the front of ambulances because the ambulance parked over their driveways. One woman in February left an abusive note on the front of an ambulance in Stoke. However, she was charged £120 and was taken to court for public order offenses.